United States Secretary of State Mike Pompeo has asked Pakistan to act against those responsible for the barbaric 2008 Mumbai attacks as Washington announced a new reward of $5 million for information leading to the arrest or conviction in any country of those involved in the carnage. The Trump administration offered the new reward (of over Rs 35 crore) on the 10th anniversary of the terror attack in which 10 Pakistan-based Lashkar-e-Tayiba terrorist went on a shooting rampage in India's financial hub killing 166 people, including six Americans. Describing the Mumbai terror attack as a 'barbarity', US Secretary of State Mike Pompeo called upon Pakistan and other nations to uphold their UN Security Council obligations to implement sanctions against those responsible for the atrocity, including the LeT and its affiliates. 'It is an affront to the families of the victims that, after ten years, those who planned the Mumbai attack have still not been convicted for their involvement,' Pompeo said in a statement, making it clear to Islamabad that the Trump administration was not not happy with the slow pace of the trial involving seven LeT suspects, including its operations commander Zaki-ur Rehman Lakhvi, who is out on bail. 'We call upon all countries, particularly Pakistan, to uphold their UN Security Council obligations to implement sanctions against the terrorists responsible for this atrocity, including Lashkar-e-Tayyiba and its affiliates,' Pompeo said. 'The US Department of State's Rewards for Justice (RFJ) Program is offering a reward of up to $5 million for information leading to the arrest or conviction in any country of any individual who committed, conspired to commit, or aided or abetted in the execution of the 2008 Mumbai attack,' the State Department said in a statement on Sunday. 'Key members of this heinous plot remain at large, and this investigation remains active and ongoing. This reward offer extends to any individual who bears responsibility for this act of terror,' the RFJ said in a separate statement. The move comes less than a fortnight after Vice President Mike Pence had a meeting with Prime Minister Narendra Modi in Singapore, during which he is believed to have himself raised thisissue and rued that even 10 years after the Mumbai terrorist attack its perpetrators have not been brought to justice. 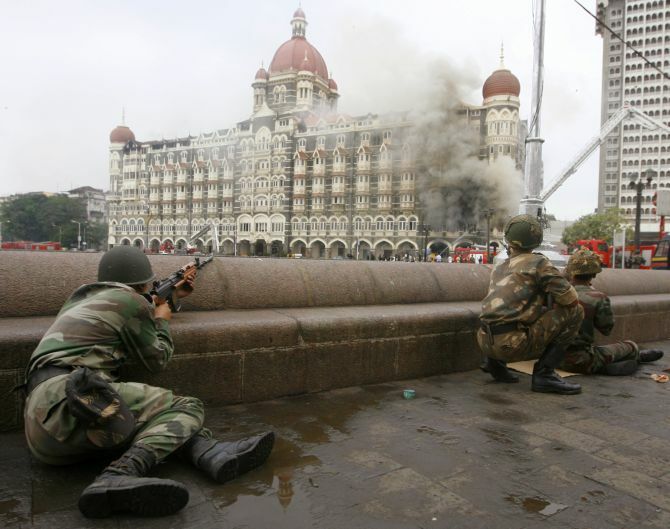 From November 26 to 29, 2008, a total of 10 terrorists associated with the LeT carried out a series of coordinated assaults against multiple targets in Mumbai, the State Department statement said. "The United States is committed to working with our international partners to identify and bring to justice those responsible for the 2008 Mumbai attack," it said. The State Department's new announcement marks the third RFJ reward offer seeking information on the perpetrators of the Mumbai attack. In April 2012, the Department of State announced reward offers for information that brings to justice LeT founder Hafiz Saeed and Hafiz Abdul Rahman Makki, another senior LeT leader. Under this, Washington announced a $10 million bounty for information leading to Saeed's arrest and conviction but, despite periods of detention over the years, he has remained free in Pakistan. In May 2005, the United Nations 1267 Sanctions Committee added LeT to the Consolidated UN Security Council Sanctions List. The State Department said anyone with information on this incident can contact the RFJ office. Individuals may also contact the Regional Security Officer at the nearest US embassy or consulate. "All information will be kept strictly confidential," it said. Since its inception in 1984, the RFJ programme has paid over $150 million to more than 100 people who provided actionable information that helped bring terrorists to justice or prevented acts of international terrorism worldwide. Meanwhile, a senior Trump administration official has said that except for designating Pakistan as a state sponsor of terrorism, the United States is looking at all possible tools at its disposal to convince Islamabad that it is in its interest to crush terrorist groups. "The focus of the discussions has not been on designating Pakistan a state sponsor of terrorism, rather how to use other tools at our disposal to convince Pakistan that it is in its interest to crack down on terrorist groups," the administration official told PTI. "Pakistan has a stark choice: Cooperate and enjoy the benefits of close relationship with the US and the rest of the world, or face international isolation if it chooses not to change its behaviour," the official said in response to a question. Speaking on the condition of anonymity, Trump administration officials say they are looking at ways through which they can convince Pakistan to change its behaviour.